Bemboka Fire from Carp Street, Bega at 2 pm. Photo: Ian Campbell. The darkness of night will soon hide the thick column of smoke coming from the Yankees Gap Road Fire at Bemboka, but there will be no rest for those fighting the flames and those living around them. 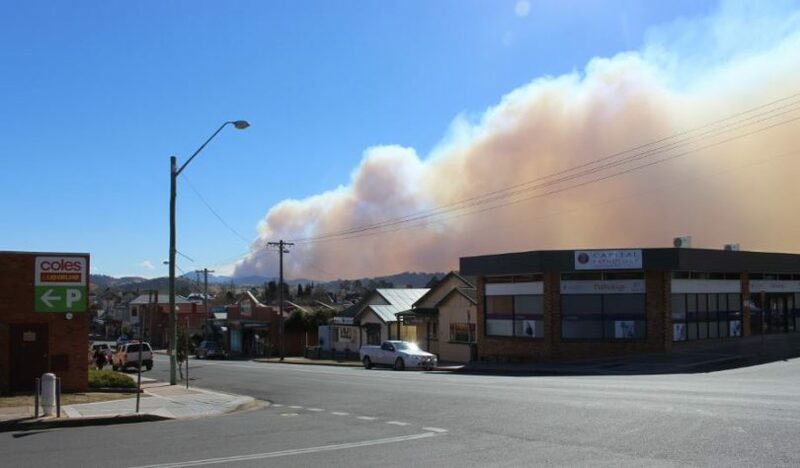 About 80 fires are burning around NSW however, its the situation in the Bega Valley that is escalating. Follow rolling updates about the unfolding bushfire emergency near Bemboka at About Regional. EMERGENCY WARNING – Yankees Gap Rd, Bemboka 4:19pm.A bushfire is burning near Yankees Gap Rd, Bemboka. The fire is currently 300 hectares in size and is out of control.Current Situation:A large fire is burning in the South East Forest National Park to the north-west of Bega.The fire is burning in an easterly direction towards the vicinity of Desert Creek Rd, Walls Flat and Scotland Yard Rd, Garfield.Firefighters have been liaising with people in the area throughout the day while the fire burnt through inaccessible property.Emergency alert messages have been sent to people in the area.Fanned by strong winds and is producing a large amount of smoke and embers.Under these conditions, fires can be difficult to control. Embers may be blown well ahead of the fire, creating spot fires that may threaten properties.Advice:If you are in the area to the north of the Snowy Mountains Highway and west of the Princes Highway you should take shelter as the fire approaches. It is too late to leave.Take shelter in a solid structure when the fire front arrives. Protect yourself from the heat of the fire.Other Information:*If your life is at risk, call Triple Zero (000) immediately. *Continue to stay up to date with the bush fire situation by checking http://www.rfs.nsw.gov.au, listening to your local radio station or by calling the NSW RFS Bush Fire Information Line on 1800 679 737. *If you live in the area but are away from home, it may not be safe to return to your property. *For information on road closures, check http://livetraffic.rta.nsw.gov.au. Roads may be closed without warning. A bush fire is burning near Yankees Gap Rd, Bemboka. The fire is currently 300 hectares in size and is out of control. Fanned by strong winds and is producing a large amount of smoke and embers. 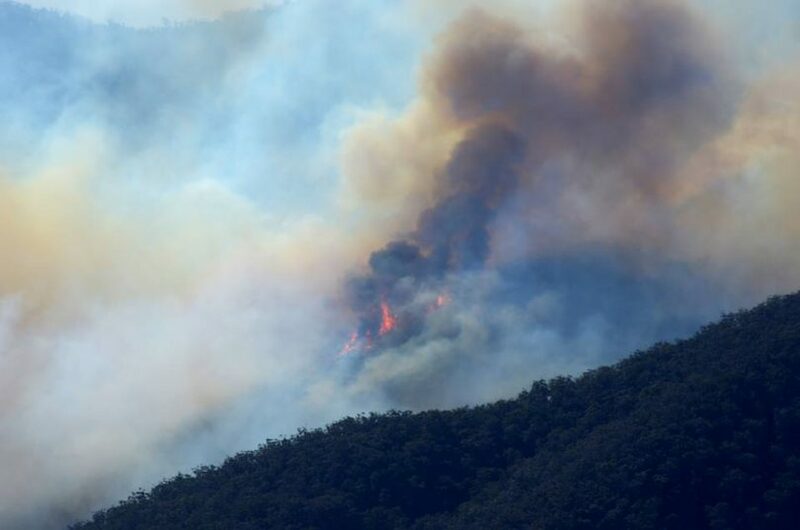 If you are in the area to the north of the Snowy Mountains Highway and west of the Princes Highway you should take shelter as the fire approaches. It is too late to leave. Continue to stay up to date with the bush fire situation by checking the NSW RFS website or calling the RFS Bush Fire Information Line on 1800 679 737. A number of other fires in the Bega Valley, Eurobodalla and Snowy Monaro that started earlier in the day are now listed as ‘under control’. The Bemboka Fire at 12 Noon, taken by Rachel Helmreich.